Every girl should have a chance to be Cinderella. Whether it’s a “lazy” day or a day where we just don’t have the energy to create an outfit, we should all get the chance to transform ourselves, and feel like the prettiest girl at the ball. With this blog. I hope to be someone’s fairy godmother, someone’s inspiration to get out of their funk. To try something new. To express themselves. To be, fashionating. Hello y’all! 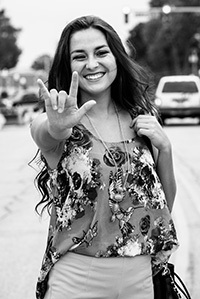 My name is Kelly Jo and I would love to introduce myself to you. I’m new to blogging, but have always had a passion for fashion and I hope to share it with you! I’m a 21 year old Junior at the Rochester Institute of Technology in NY, majoring in Marketing with a concentration in Public Relations. I hope to become a travel style/fashion blogger, and eventually an ambassador for a brand. I would eventually love to start a new brand, but as of right now, I’m working with old pieces to create new looks. 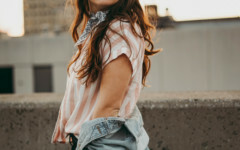 As many of us can likely relate, I’m also working with the typical budget of a college student, but I think no matter who you are, it’s important to know that you can be fashionating without spending a ton of money! My initial goal is to show people in terms of what trend has released, what to buy, and how to get them to step outside of their comfort zone. While of course, finding the best deals possible and sharing with y’all! After all, fashion is one of the biggest ways to make a good first impression. To “wow” a room without saying a word. I was born and raised in a small town in Indiana. Being from a small town and expressing yourself through style is borderline unheard of. I crave to break the mold. I hope this blog inspires more small town girls (big city girls are allowed to be encouraged too!) to dare to be different. To put effort in. To wear what makes you happy. To be YOU! I remember being little and making ball gowns out of towels with my older sister, cutting up t-shirts from Goodwill to make it interesting and new again, putting together two patterns that most wouldn’t put together to make a new look. Fashion has always fascinated me. This quote inspired me in many ways. For example, in a world where words aren’t important, you quickly learn that your expression says a lot more than a few nouns and adjectives strung together. You can show pain by a burrowed brow. Joy from a wide, eye-scrunching smile, love with a soul-searching gaze. What I hope we can show each other is how to show our best, true selves, through our own unique style. Your clothing can express more about your personality and character than words. As the saying goes, “a picture is worth a thousand words,” a simple dress with a statement necklace is worth a thousand words in how we can express our feelings and personality. I hope that you will enjoy reading my story and perspectives on fashion and that it helps you tell your story. It sure feels oxymoronic to express yourself in words is inadequate as to expressing yourself through the way you express through being you! Peace, love, and… lots of hugs! Black Wedges: $12.50. These easy-to-walk-in shoes are from Shoe Show! Sunflower Print Crop Top: $17. Get this adorable summer-y top from Polyvore! Black Scalloped Skirt: $38. Get this perfect skirt for any occasion from Francescas! 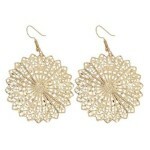 Gold Metal Ornate Flower Earrings: $3.50. be surprised what Walmart has to offer! 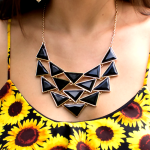 Black Statement Necklace: $17. Go to Francescas to get this statement piece! 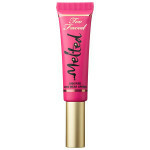 Bright Pink Lip Liquefied Stain: $21. Get this lip stain that lasts all day from Sephora!